OK…this is getting a little ridiculous! OK…this is getting a little ridiculous! How many have you heard, “Hey Honey, the pet(s) need food” one time or another? In our house that is getting to be quite a common (and frequent) thing to hear now that Acorn Lane Farm Petting Zoo, which is our backyard, has grown more than we realized. It’s funny how things slip up on you and then it takes one moment of looking at things differently to realize how big something has gotten. I had just one of those moments tonight when I went out to feed our animals. We usually run out of food for the animals at different times, therefore it tempers for us how much food we really go thru at a time with this new petting zoo venture of ours. However today almost every species of animal (almost all) on our little micro farm needed food. 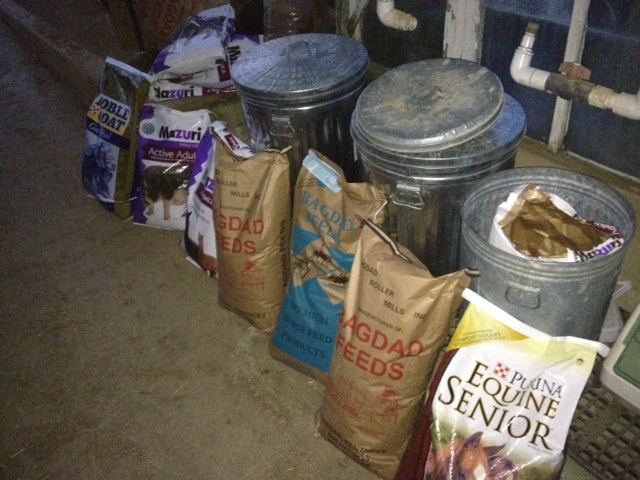 Hope went to our local feed store in Crestwood, Crestwood Feed and Seed, and picked everything up. I had a late meeting tonight but I texted Hope and told her that I would feed when I got home, since she had the kids. She told me that the food was in the back of her Explorer. After unloading, and carrying 7 bags of feed ( 350 pounds) back to our storage area I looked at it all and said to myself, “OK this is getting ridiculous and a little out of control!” I guess that is what we get for having Chickens, Goats, Alpacas, Guineas, Ducks, Geese, Pigs, Horse and miniature Donkeys. And that’s not counting the Dog, Bees, Cats, Rabbits (currently 9 are in cages in our house, more about that at a later date) and Fish on the property! But you know what, I wouldn’t trade it for all the world. We are having so much fun and cannot wait for all of our friends to come out this spring and see all of the madness we have been up to!! Here is all of the food that was in the back of the Explorer.